King of the bench: A Bengal cat battles a dog on a park bench. Kitten identity crisis: A cat that thinks she’s a dog. Kitten loves her “mama:” A stray kitten becomes attached to his “mama,” a Saint Bernard. 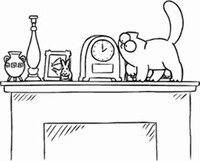 Simon’s Cat in “Shelf Life:” An episode from Simon Tofield’s popular animated series. Too many cooks in the kitchen: A Bengal cat wrestles with a Shiba Inu puppy on the kitchen floor.